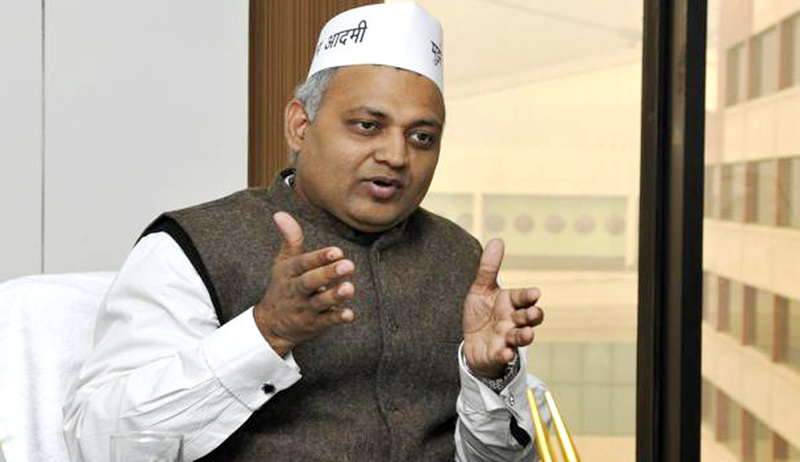 Delhi High Court today, refused to grant bail to Somnath Bharti, Former Law minister of AAP Government and the present MLA of Delhi assembly, in a complaint filed by his wife accusing him of domestic violence and torture among other allegations. Justice Suresh Kait observed that the allegations against him are not baled but supported with documentary proof. The court also said that Bharati has misused the protection given to him by the High Court. The Prosecutor submitted that Bharti, used to harass and torture his wife by repeatedly abusing at her work place knowing fully well that health condition of the complainant was not well as she was diabetic and hypertensive. The horrific nature of torture is evident from the email sent by Bharti’s wife to him, which is reproduced in the Delhi High Court order. The email sent in March, 2013 says “I don’t think even a rouge will treat a 7 month pregnant woman the way you have treated me.” It also describes the injuries perpetrated on the pregnant wife by violent dog. During the argument, medical reports substantiating the same was produced before the Court. The court opined that the complaint against Bharati is not a simplicitor one for the offences under Sections 498-A/406 IPC but the complainant has been tolerating cruelty with brutal assault. Taking note of his present status as Law maker of Delhi assembly, the Court said “The petitioner is elected as Member of Legislative Assembly of Delhi. He should have shown more generosity and responsibility towards his wife and children. Earlier, he had financial difficulties, therefore, every time, he compromised with his wife. But after electing MLA, he failed to win the sentiments and trust of his wife”. The court also took note of various other complaints against the AAP leader, and observed that he seems not only violent and outrageous at home but also before the public at large.